This memorable, heartbreaking story opens in Addis Ababa, Ethiopia, 1974, on the eve of a revolution. Yonas kneels in his mother’s prayer room, pleading to his god for an end to the violence that has wracked his family and country. His father, Hailu, a prominent doctor, has been ordered to report to jail after helping a victim of state-sanctioned torture to die. And Dawit, Hailu’s youngest son, has joined an underground resistance movement—a choice that will lead to more upheaval and bloodshed across a ravaged Ethiopia. 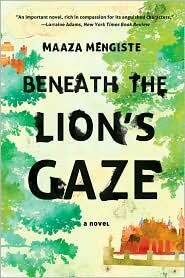 Beneath the Lion’s Gaze tells a gripping story of family, of the bonds of love and friendship set in a time and place that has rarely been explored in fiction. It is a story about the lengths human beings will go in pursuit of freedom and the human price of a national revolution. Emotionally gripping, p.etic, and indelibly tragic, Beneath The Lion’s Gaze is a transcendent and powerful debut. Maaza Mengiste was born in Addis Ababa, Ethiopia. A Pushcart Prize nominee, she was named “New Literary Idol” by New York Magazine. She lives in Brooklyn, New York. What role do the lions of the title play in the book? What do they represent? Why do you think Hailu insists on keeping his wife, Selam, alive when he is willing to let others die in peace? What is the relationship between suffering and dignity in this book? Mickey makes a decision to value his family’s safety and comfort over taking a moral stand. What do you think influenced this decision? Do you sympathize with him? At many points in the book, personal tragedy, such as Tizita’s injury, is contrasted with national tragedy. What are some other examples of this? What is the effect of this contrast? What does the Emperor represent for the people before the revolution, Mickey in particular? How does that change? What is the effect of having sections told through the Emperor’s point of view? How is his mindset changed by power? How do you feel about Hailu’s decision to give poison to his patient? Did your opinion about his actions change over the course of the book? Dawit has very different ideas about how to act in the face of the Derg than Yonas. Do you think one of their approaches is better than the other? Are there times when you see one brother’s ideas influencing the actions of the other? Does the author or the novel itself take a side in the political struggle? What makes you think that it does or does not? Beneath the Lion’s Gaze is based on real events that took place in Ethiopia in the 1970s. Do you think a novelist has a responsibility to respond to national tragedies? How have you reacted to novels that take place during events that you’ve lived through?